Shocking CCTV has shown how Liam Hunt's killers laughed and joked in a Northampton town centre McDonald's minutes after the fatal stabbing. Footage shows how in the half hour after the 17-year-old was stabbed in the neck his killers fled the scene, buried a knife in a planter and gleefully reenacted the attack in the restaurant in the Drapery. The attackers laughed and joked as they played out the attack in McDonalds in the Drapery. 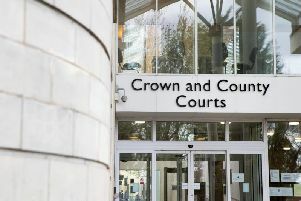 Following a 12-week trial, five young men have been convicted for their part in the teenager's death in February last year. Lee Warren, aged 18, of Queens Park, Northampton, Aaron Joseph, aged 21, of Waltham Forest, London, and a 17-year-old boy, who cannot be named for legal reasons were all found guilty of manslaughter. And earlier today (May 11), Derice Wright, 18, from Abington, pleaded guilty to manslaughter. The killers flee the scene. The brutal attack on Liam Hunt was not captured on CCTV. The footage, which was played to the jury, shows how the gang left the McDonald's in the Drapery and headed to St George's Street where Liam was smoking with his friends. The fatal attack, in which Allaban-Hamilton inflicted a seven-centimetre neck wound on Liam, was not caught on camera. But it does show the group sprinting from the scene. Wright was caught burying a knife in a planter as he and Allaban-Hamilton fled the scene. The gang then regrouped in the same McDonald's - and can be seen graphically reenacting the attack on Liam, with the 17-year-old gesturing to his neck. On the right, Derice Wright can be seen plunging his hand into the soil to bury a knife minutes after fleeing the scene. The five convicted young men will be sentenced in a month's time. Two other teenagers - James Dodd, 18, from Northampton, and another 17-year-old - were found not guilty on all charges. GUILTY: Aaron Joseph, left, was found guilty of Manslaughter. Kane Allaban-Hamilton, centre, was found guilty of murder. Lee Warren, right, was found guilty of Manslaughter. Derice Wright pleaded guilty to manslaughter.